Anime is no stranger to the plot device of having its protagonist revisit the same events over and over again - the interminable Endless Eight story arc of The Melancholy of Haruhi Suzumiya's second season gave the idea a bad name, while more successfully Steins;Gate brought much drama from Rintarou Okabe's desperate efforts to save those close to him while reliving the same series of days over and over. More recently, ERASED took in some far greater leaps in time to further its own murder-mystery story. This is some heady company for the currently airing Re:ZERO -Starting Life in Another World- to reside amongst, yet somehow it's arguably managed to top all of these prior examples in making full and intelligent use of its time-repetition mechanic to produce one of the year's biggest hits and a series that has been on people's lips each and every week as its story has progressed significantly. So how has Re:ZERO managed to make such a splash? On the surface, there's nothing all that original about the show - Subaru follows the time-honoured anime protagonist path of suddenly finding himself transported to a mysterious fantasy world, wherein he goes about his business trying to not only make his way in this world but also eyeing up a starring role within it. Unfortunately for him, death lurks in a many a dark corner of this land, and even more unfortunately Subaru has an uncanny knack for finding it - luckily for him and him alone, death in this world doesn't mean the end of it all but rather another opportunity to start afresh from a suitably convenient point in the past. 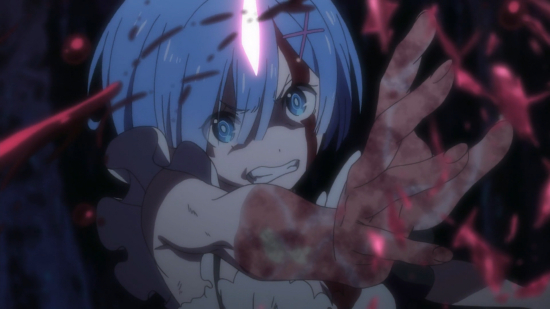 Where Re:ZERO truly stands out is how it uses its time reset mechanic (or "Return by Death" as Subaru himself refers to it) - while some of the other series we referenced focus entirely on the main character making a difference to the situation at hand, Re:ZERO has more that it wants to do with its given scenarios than just advancing the plot. Rather than simply having events revolve around Subaru and others directly involved in those events, the series paints with broader strokes, exploring its wider world during these periods in a way which undoubtedly expands its canvas. The most impactful manner in which the series cherishes its opportunity to revisit a given period multiple times is in how it uses this plot device to more fully examine its characters. This is clearly leveraged from the off, as the first two major characters we meet in both Emilia and Felt see their roles, background and personalties built quite significantly through each "reboot" of its scenario. Emilia in particular is a prime example of this - we spend some time with her, even learn her name, then Subaru's death and subsequent attempt to alter things quickly makes it clear that some of what we thought we knew wasn't in fact true at all. By far the most striking example of this use of Return by Death to reveal multiple facets of characters comes with its second story arc and the introduction of Ram and Rem to the cast. At first, this twin pairing of maids seem set to be little more that cute comic relief as they verbally tease and snipe at Subaru to bring a little more entertainment to proceedings. However, events that initially seem unrelated to the two girls slowly build up a far more fully-fledged picture of their characters over each cycle of events - there's far more to both girls than just sharp tongues which itself brings us one of the show's strongest (and almost literal) cliff-hangers. Once this is revealed, another cycle gives us opportunities to get to the bottom of their behaviour, while further events ultimately allow us to dig into their back story and the origin of both of their true natures. Come the end of this arc, you've been taken on a rollercoaster ride which has also built and developed Ram and Rem's characters massively in a way that simply wouldn't be possible (or certainly wouldn't be enjoyable) without clever and judicious use of Return by Death to build layer upon layer of personality to these characters. The reason why this level of character building is exceedingly important to Re:ZERO's success becomes clear in its latest story arc (at the time of writing) - episodes fourteen and fifteen in particular are built almost entirely on the strength of the viewer's perceived relationship with all of the major cast members. 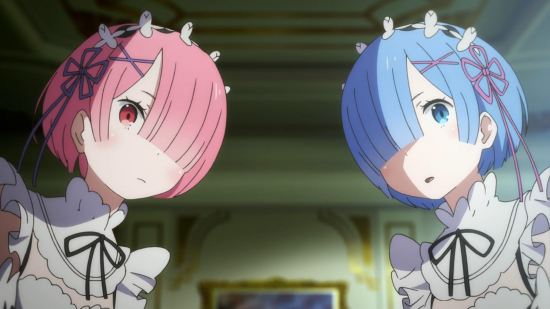 For another series this might be a risk - who knows what characters you might feel close to or associate yourself with - but for Re:ZERO its expert manipulation (in the best possible way) of your feelings for each and every player in its story means that it knows exactly how you feel about the cast, and similarly precisely how you'll feel when they're placed in grave peril or worse. This assured knowledge is what allows the series to go to the brutal lengths it does, delivering gut punches to the viewer precisely because of the way it's ensured you're engaged with its characters. In another series, the events of episode fifteen - or at least the attempts to wring so much emotion from them - would feel gratuitous or forced, but here it works because you've seen so many sides to the individuals involved and have followed so many facets of their journey so closely that every horrific scene that unfolds is a dagger through your heart on a level far beyond its sheer shock value. You know these people intimately, and to see their fate play out is a horror unto itself even when divorced from its violent manner. This is accentuated by the show's willingness to explore the effect that events have on Subaru's psyche - much like Steins;Gate, having to relive myriad events so many times has a marked impact on the mental well-being of Re:ZERO's protagonist. This doesn't just mean taking him to the depths of despair, but also to the heights of over-confidence - at one stage Subaru's feelings of self-importance leads to him seeing himself as so invaluable he inadvertently causes a major rift in his relationship with Emilia, which marks the start of his descent into the horrific depths of what is to come for him. In a genre where many similar shows build their protagonist as an almost god-like hero of everything they survey, Subaru is clearly a very flawed and very human character, whose personality and reactions are very distinctly coloured by the events he's witnessed and taken part in. All of this is an example of character development at its best - brought about organically via unfolding events in a manner which always fits with both the individuals and circumstances at hand, which in turn brings power to the narrative in a way that can only be commended in the highest terms. If you've found yourself dismissing Re:ZERO as just another "trapped in an RPG" anime series, hopefully this will give you pause for thought - look beyond its fantasy video game trappings and well-worn basic premise and you'll find a rich world filled with characters who act and feel in a truly believable fashion. You'll come to love Re:ZERO's cast, and rightly so - the only bad news is that this series has no compunction about using that adoration against you and putting you through the wringer. It's not for the faint-hearted, perhaps, but the results of its carefully crafted setting and characters makes it the year's most compelling show so far in our book.